That awkward moment you wake up to one of the loudest explosions you’ve ever heard and think it’s probably just the local nuclear power plant having a meltdown. And then you remember what thunder sounds like. I know. I know. I should either go play the lottery or go to the gym and try one of my bad pick up lines. Simone: Nah, you should be outside dancing in the rain. Oh yes, I can make this work. Chad: You just gotta be ready to make good on it if she says yes. Kimberli: Your next line could be, “Have you ever heard a thunderstorm from the inside of my car? Zero: That made me groan, Kimberli. It’s perfect. 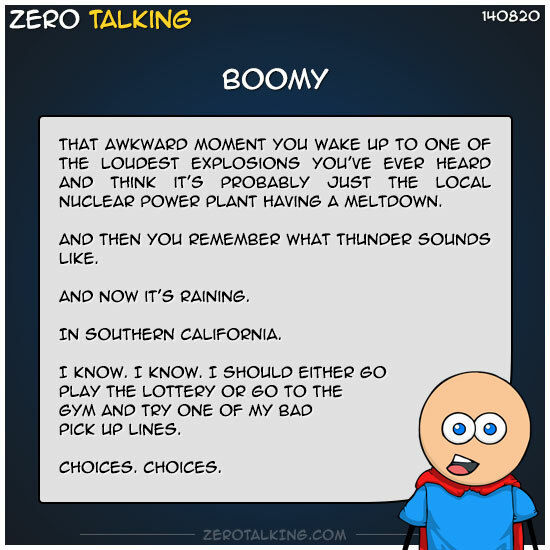 Rebecca: It doesn’t rain and/or thunder in southern California? Zero: California is in the midst of a very serious drought. Rain is very rare, let alone thunder showers. Catherine: Just remember to be humble. Zero: Someone got offended with my “huge ego” on Google plus because I was talking about how humble I am. So I’m not sure how to go about letting people know I’m really freakin’ humble at this point.